All rubies are one of the true beauties of the natural world. With their deep red color, they just demand attention and are just stunning. It makes no difference whether used alone or when used in a setting with diamonds. Used in engagement rings, they are just spectacular and are extremely adaptable to a wide variety of cuts and placements. The ruby is one of the “Big 4” precious stones along with diamonds, sapphires, and emeralds. Otherwise, gemstones are semi-precious. 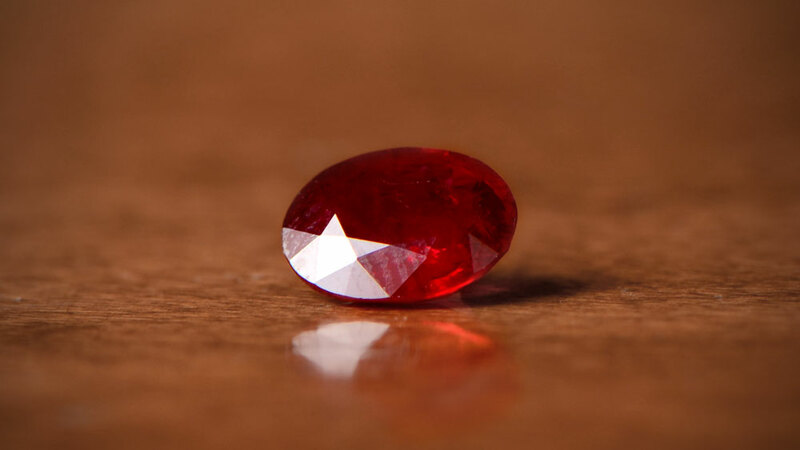 The same mineral, corundum (aluminum oxide), makes up both rubies and sapphires meaning a ruby is really a red sapphire. It is the presence of the element chromium which causes the red color. Under a concentration of 1% chromium, the ruby will still be blue and therefore classed as a sapphire. Above 1%, chromium absorbs light in the green-yellow part of the spectrum and creates the visible red hue. Rubies are one of the hardest of all known natural elements, after diamonds and moissanite. All natural rubies have imperfections, which is the main indicator of a natural stone vs. a synthetic example. Rubies are heat treated unless already perfect, which is extremely rare. Heat-treating improves the red color and also can serve to reduce the imperfections. Two stones of equal quality, one treated one not, will have very different values. A ruby that has been must be disclosed as such, and this reduces the value. An untreated ruby of high quality will command prices much closer to that of a diamond of the same quality. Whatever the imperfections, it’s hard to find a more beautiful stone of any kind. As with most colored gemstones, the deeper the color, the more prized the stone. Ruby is also the birthstone for the month of July. Rubies have been used as decoration and a sign of importance since ancient times and were commonly traded on the Silk Road. They are even mentioned a couple of times in the bible. 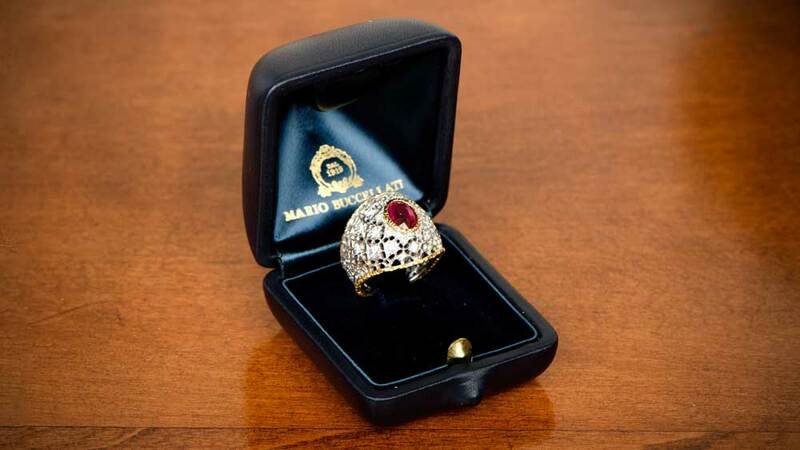 Asia, in particular, is a region which has long prized the ruby for good luck. As well as being embedded into weapons for luck during battle, they were often placed in the foundations of building to protect the person living there. Although beautiful in their own right, it is unusual to find an engagement ring which has just a single ruby and nothing else. Where we have the Solitaire ring to show a single diamond, no such equivalent exists for rubies. 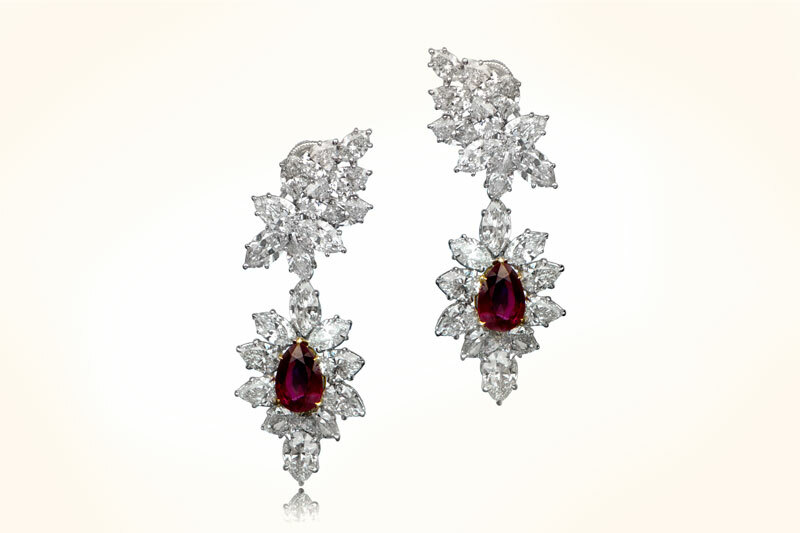 Instead, rubies tend to be matched with diamonds to provide the sparkle. The contrast of the deep red of the ruby against the bright white of the diamonds makes a wonderful combination. Despite the popularity of diamonds in engagement rings since the 1920s, colored stones have gained a legion of fans in recent years. Rubies and sapphires are both very popular, and vintage rings containing them are quickly growing in popularity. They are also, carat for carat, significantly less expensive than diamonds of a comparable standard, and therefore offer a great deal more for your money. To view our full collection of Ruby Engagement Rings, click here. 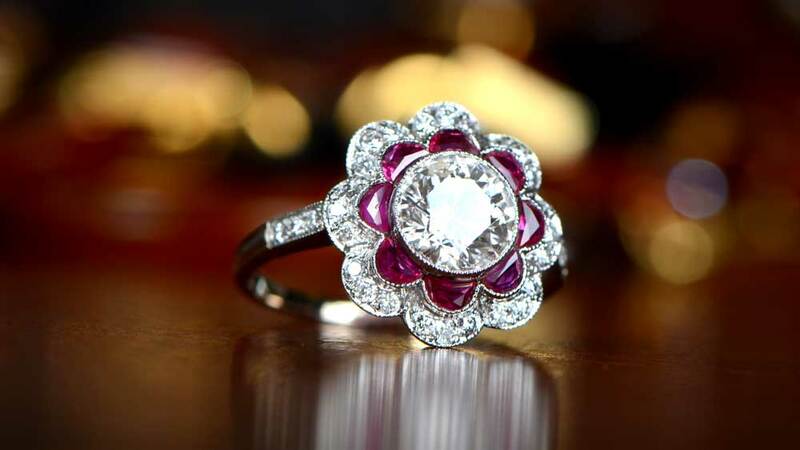 Of course, the best way to display a beautiful ruby is to have it as the center stone of your engagement ring. Many engagement rings do take this approach and use diamonds as a way of highlighting the ruby’s beauty. Because of the heavily contrasting colors, many more options are available to designers than might otherwise be practical. Diamond halos are common on ruby engagement rings to further add contrast. In many designs, a diamond halo will be punctuated by smaller rubies, to create a striking contrasting effect. The color also makes the ring appear larger than it might otherwise do if it were just diamonds. Cuts complying with very well defined proportions is the preserve of the diamond. Rubies aren’t quite so formal. Basically, if a ring designer wants to cut a ruby into the shape of his pet dog, he can do. The key is to make sure the cut complements the design. Ovals, squares, lots of facets, few facets, fancy cabochons, it doesn’t matter. It may be that the cut is determined by the location of the imperfections. Or, it may just be that the designer liked it that way. The key with rubies is that they are the star and like to show it. 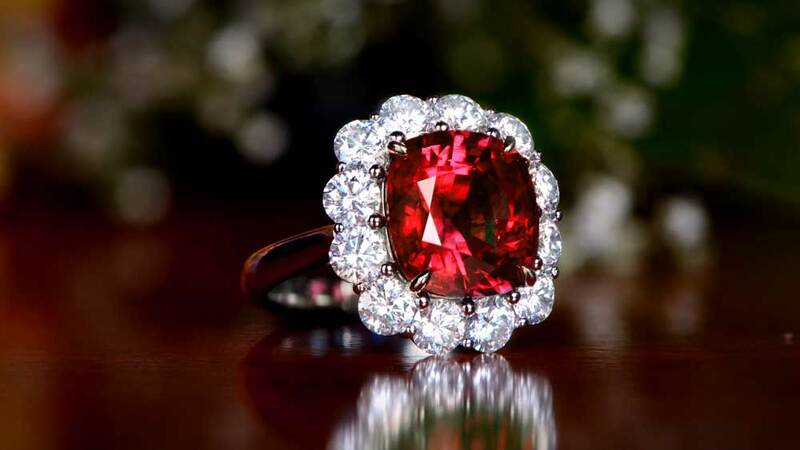 Diamonds, as beautiful as they are, make stunning engagement rings, but there’s just something about a big red ruby sitting proudly at the center of it all. Dorothy didn’t wear diamond or sapphire slippers to find the Emerald City, she wore ruby ones. What more proof do you need?